What Should Authors Expect to Earn? A funny thing about authors: they’re not a modest bunch. Even the most humble, down-to-earth authors I know have wild expectations about the potential their book has to be a best-seller; to earn out; to change their life. I get it. A lot of authors pin their dreams on their books, and there’s something beautiful about that. And while no aspiring author needs to be denied hope, or to be told not to dream big, I’ve seen the flip side of soaring too high. Sometimes hope balloons get launched only to be deflated later in so many ways—slowly with the dawning of a realization that the aim was too high; violently with angry resentment; tragically with the onset of self-pity. If knowledge is power, authors could spare themselves these sad aftermaths by understanding what the industry considers to be good sales numbers. When I first started She Writes Press, I used to ask the authors what kinds of sales they expected from their first book—generally a debut novel or memoir. I heard one number come up pretty often: 10,000 copies. That seemed to be a benchmark authors deemed to be possible, perhaps attainable. But the truth is it’s a very hard number to hit. A few of our authors have hit 10,000 copies sold, but that’s with paperback and e-book sales combined, and it usually involves some sort of ebook campaign. If you want a crash course in author earnings, there’s a whole site dedicated to it called Author Earnings. Its limitation is that it’s dedicated to a discussion of ebooks. Run by self-publishing advocate Hugh Howie and a guy called Data Guy, their unequivocal goal is to show how indie authors make more money self-publishing (ebooks) than do traditional authors traditionally publishing anything. 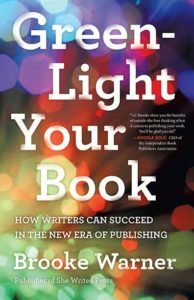 It’s good to dig into the numbers, but it’s also self-evident that self-published authors would make more money (hand-over-fist more, actually) than traditionally published authors on ebooks because they take home 70% of their earnings whereas traditionally published authors take home 25%, minus their agent’s commission. I recommend reading Kristine Kathryn Rusch’s October 2015 post, “Business Musings: Author Earnings.” not just for her dissection of Howie and Data Guy’s logic and analysis, but also for another important point she makes about how to make a living as an author—that you have to publish often and well. I see two types of independent authors: The first batch are those who have a legacy project they want to publish beautifully and be proud of. They want their book out in the world and for it to have a fighting chance at getting reviewed, being carried in bookstores, and selling a decent number of copies (maybe 1000 or more). These authors have a very good chance of achieving their goals. The other subset are those who aspire to be career writers. These authors expect to earn out their expenses and to turn a profit on their investment. They want the other things too—to be in bookstores, to be reviewed, etc.—but their expectations are generally higher, and wrapped up in money, because earning out and selling a predetermined number of books is tied together with their perception of success. Thus, more is at stake, and they expect to succeed. If you’re in this latter category, there’s good news/bad news. The good news is that it’s possible to earn out your expenses and turn a profit on your investment. The bad news is that there’s a very slim chance that this will happen with your first book. You need to keep creating content and stacking up more product (in the form of new books) to generate five-digit sales numbers. Very few independent authors reach 10,000 sales, and when they do, they’re typically scooped up by traditional publishers. Rusch makes the incredibly good and valid point that the most successful type of authors are those who are publishing every which way they can. Sometimes called “hybrid authors,” these are writers who publish traditionally, who self-publish, and who publish in between—perhaps through other independent models, or perhaps publishing some digital-only books. To make money in book publishing, you are best off looking at your first book as an investment in yourself. It’s unlikely to earn its money back, and its success should be directly measured against how much money you put into publicity. It’s difficult to give a hard number on what a “successful” independently published book might be, but we can look to traditional publishing to direct us. In traditional publishing, a book is a “failure” if it doesn’t earn out its advance. By that logic, an independently published book might only be considered a success if it earns out its investment. An author who spends $500 on a marketing and publicity campaign will have a very different experience than an author who spends $10,000. However, the author who spent only $500 will be “successful” at a much lower rate of sale than the author who spent the ten grand. If earning out is going to be your measure of success, consider a few points. One, do as traditional publishers do and allow that earnout expectation to be spread out over three years. Two, allow for your first book to be an investment in yourself—in the brand of you, future author of many books. And three, get savvy about all the ways you might sell your book. Savvy authors are doing ebook campaigns through companies like BookBub. They’re finding avenues to sell their books directly—to corporations, hospitals, rehab centers, associations, etc. They’re creating affiliations and partnerships. Publishing a first book may be a thing on your bucket list, and if that’s the case, and you don’t want to think too much about the money, then don’t. But if you’re serious about earnings and have your sights set on becoming a career writer, writing your first book is not unlike standing at the threshold of a new galaxy. There is so much to learn, so much to explore, infinite paths that might lead to sales, and any number of unexpected relationships that might be forged. If you have the aptitude, this could be the beginning of something amazing and exciting and lucrative. But don’t for one second think all you have to do is to keep writing. You have to treat your writing as a business. Take a course. Read up. Follow people who know more than you. And then you keep writing, yes, but also keep producing, keep learning, keep growing, keep up. And godspeed! Who Needs an Author Platform Anyway?